Australia and Canada are two Developed Markets (DM) that stand out in their reliance on commodity extraction to fuel their growth. The rise of China and the commodity super cycle over the past 30 years has proved a blessing for these two Commonwealth realms. Unlike many of HM’s past fiefdoms, these two countries were able to escape the middle income trap and become developed nations. China imported raw commodities in size to fuel industrialisation, and then exported the finished knick-knacks to the world. Canada benefited from higher oil prices and expanded production into high cost per barrel regions like the Alberta tar sands. Australia provided China with raw industrial commodities like iron ore. The wealthy Chinese who wanted to safeguard their newfound riches started buying property in droves in marquee cities like Vancouver and Sydney, which sparked a housing boom. Rising commodity and housing prices made everyone feel like a winner. Unfortunately the slowdown in Chinese economic activity and falling commodity prices landed a heavy blow to both countries in 2015. The eager Chinese property buyers are fading quickly. The enforcement of capital controls and a worsening business climate in China, has cooled investors desire for expensive Canadian and Australian property. Their currencies became a proxy bet on China, and as such received the stick. Bitcoin in AUD and CAD terms is up 140% from the beginning of 2015. Faced with a deteriorating economy, the central banks of Canada and Australia will continue cutting interest rates. The Bank of Canada overnight rate is 0.50% and the Reserve Bank of Australia’s cash rate is 2.00%. These policy rates will be zero in to no time if there is no rebound in the Chinese economy and or commodity prices. With USD rates rising, CAD and AUD have much more pain ahead. Canada and Australia’s situation is not different from EM countries like Brazil. Citizens who find themselves less wealthy, should look for alternative ways to protect what they have left. The fundamentals behind Bitcoin ownership in DM countries is no different than from EM ones. The incremental demand from Canada and Australia for Bitcoin won’t be on par with China, but every little bit counts. Many thought a Santa rally would take Bitcoin over $480 on Christmas day. China said no and took the hammer to Bitcoin over the next two days, culminating in the XBTCNY rate trading at a discount. Some speculated that the ponzi scheme MMM’s operators were cashing out. There is a rumour that they halted withdrawals until January 5th. That might be true, but a more plausible explanation is that savvy traders chose a perfect time to execute a bear raid whilst the Christian world was singing Jingle Bells. When Bitcoin trades at a discount in China, it surely points to an invalidation of my trade thesis of a weakening CNY pushing money into Bitcoin. However, I counter that nothing changed in terms of monetary policy over the weekend. 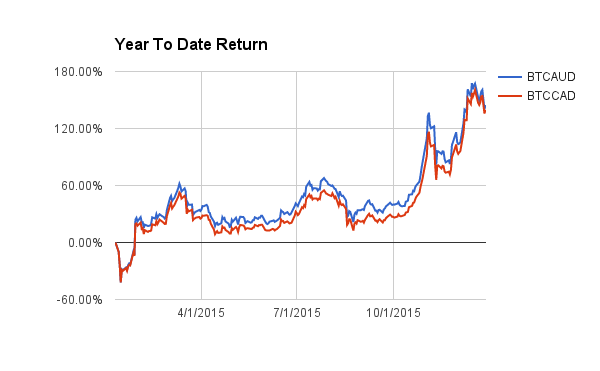 The CNY is must depreciate vs. other currencies for the China to increase export competitiveness. And the economic climate in China is not improving, nor are capital controls getting looser. The temporary dislocation in China is an excellent buying opportunity. If one doesn’t want to take an outright position, a China premium spread trade is a good strategy. Buying Bitcoin spot in CNY, and selling BitMEX weekly hedging contracts, XBU7D, is the appropriate expression of the trade thesis. 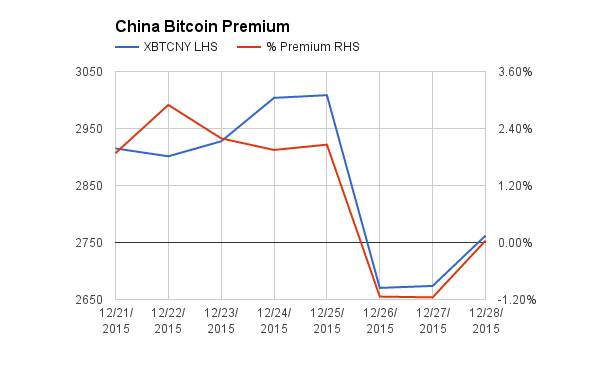 Buy Bitcoin / CNY onshore in China. If you are located outside of China, BTCC offers the ability to wire USD and convert into onshore CNY for the purpose of trading Bitcoin. Sell BitMEX XBU7D futures contracts. These futures contracts are great for spread trades vs. spot because each contract represents $100 of Bitcoin at any price. As Bitcoin / CNY trades at a larger and larger premium to Bitcoin / USD, the spread will widen and the trade will show a profit. Those hoping for a Christmas miracle were witness to an epic dumpfest this past weekend. From $460, the market crashed with fury over a few hours and almost touched $400. $400 held and the market is now testing $430. The period from December 25 to January 4th is a trading dead zone. Trading volumes globally will be thin as the world’s Bitcoin trading hubs, save Shanghai and Beijing, are effectively closed for business. Expect extreme market action in short bursts as traders run bear raids and short squeezes to inflict max pain on weak hands. The relevant support and resistance levels are $400 and $475. A break below or above will usher in a flood of market volatility. Last year, the Bitcoin price dropped 50% in the two days following the New Year. Expect extreme volatility as traders return with fresh eyes and a clean balance sheet. BitMEX 100x Daily Bitcoin / USD Futures, XBT24H: Go long with an upside target price of $440. BitMEX 50x Weekly Bitcoin / USD Futures, XBT7D: Go long with an upside target price of $460.